This section gives an account of the history of 5637, detailed information on a particular topic can be found by clicking on the buttons. 200 locomotives of the 56XX class were built by the Great Western Railway in the 1920's. 5637 is one of the 56xx class of tank engines built by the Great Western Railway (GWR) between 1924 and 1928. This followed the railway grouping of 1923 where a number of small South Wales railway companies were absorbed into the GWR along with their stock of locomotives. The companies absorbed were the Taff Vale, Barry, Brecon & Merthyr, Cardiff and Rhymney railways which had a large number of engines specifically designed to cope with the steep gradients, sharp curves and heavy coal trains found in the South Wales coalfields. However after the grouping the GWR found that a significant number of the engines they had acquired were at the end of their useful life and there wasn’t an existing type of GWR loco that could replace them. Accordingly Charles Collett, GWR Chief Mechanical Engineer, designed the 56xx class of engine that was based on the successful Rhymney Railway M and R classes of locomotive. 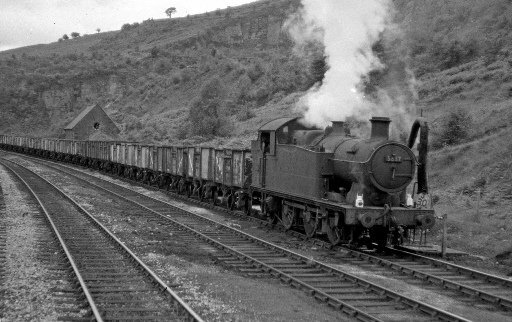 This had a 0-6-2 wheel arrangement that gave the locos a short wheel base for negotiating the tight curves of the South Wales valleys and support under the bunker which allowed a large amount of coal to be carried. There were a number of teething problems with the new 5600 class of locomotives, particularly a tendency to derail and axle boxes running hot. Typically these engines went chimney first up the valleys then returned bunker first using their trailing wheels to help guide the loco back down. The hot axle boxes were found to be caused by the tight tolerances used on GWR locos. Locos used by the South Wales railway companies had a much looser tolerances which allowed them to negotiate the tight curves of the South Wales lines without a problem. The vast majority of 56xx class locos were based in South Wales which earned them the nickname “Taffy Tanks”, however following a fall in the South Wales coal trade in the 1930s some were re-allocated to other parts of the GWR network. So 56xx class locos could be found all over the network including Bristol, Worcester, Swindon, Wolverhampton, Birmingham, Weymouth, Chester and London. 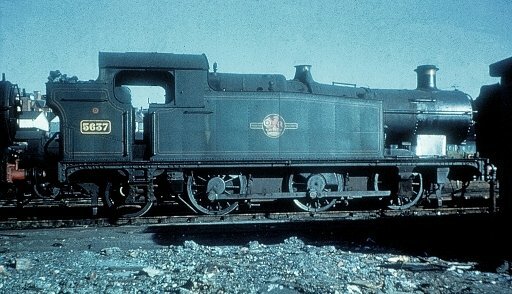 Two members of the 56xx class were even based at Westbury in the 1950’s. 5637 worked in the South Wales coalfields under the GWR and passed to British Rail when the GWR was nationalised. No. 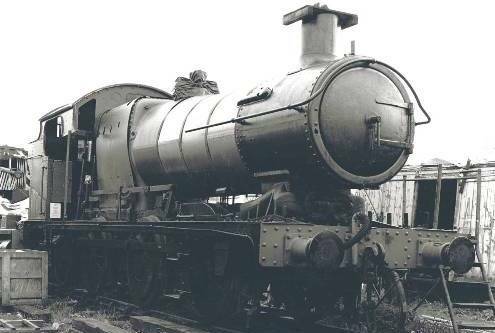 5637 was built in the GWR workshops at Swindon in 1925 to lot number 228. 5637 spent its entire working life in the South Wales area and initially went into service at Cardiff Cathays shed in September 1925. That November, it was reallocated to Barry, followed by Abercynon in October 1928 where it remained. Although the 56xx class of locos were specifically designed to haul coal trains in the South Wales coalfields it would be a mistake to dismiss them purely as powerful goods engines. They proved very flexible in practice and due to their small wheels had rapid acceleration with a top speed of 60 mph. This made 56xx locos ideal for pulling stopping passenger trains and explains why 5637 is so suited for working on heritage railways. 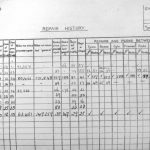 5637 is believed to be the first 56xx class loco to be used for passenger service, recorded as having taken the 6:50 pm train from Barry Island to Cardiff Riverside on Monday 24th May 1926, less than a year after it first entered service. 5637 originally had front steps with a single rung positioned in line with the sander boxes. These were replaced by two rung steps, located in line with the front wheels. The loco originally had two additional forward facing ‘porthole’ cab windows located above the boiler (see 1930 photo in Gallery). These windows were removed for some reason and the blanked off windows can still be seen in the cab. 5637 was subsequently modified along with the rest of the 56xx class to add a lamp recess and extension to the rear of the bunker and fit sliding doors to the cab side windows. Large “Stroudley” weights replaced the small original pattern balance weights on the driving axle and parallel buffers replaced the original tapered buffers. The original tall safety valve cover was also replaced with a shorter version. The loco passed to British Railways on nationalisation†in 1948 when BR classified the 56xx class as mixed traffic locomotives. 5637 moved to Radyr in September 1955 and to Treherbert the following month. The locomotive finished its days back at Barry, to where it returned in March 1960. 5637 underwent overhauls and repairs at a variety of workshops including Swindon, Caerphilly and Stafford Road. The locomotive had its final Heavy General Overhaul in Swindon works during 1963/1964. At withdrawal it had worked just short of 800,000 miles. 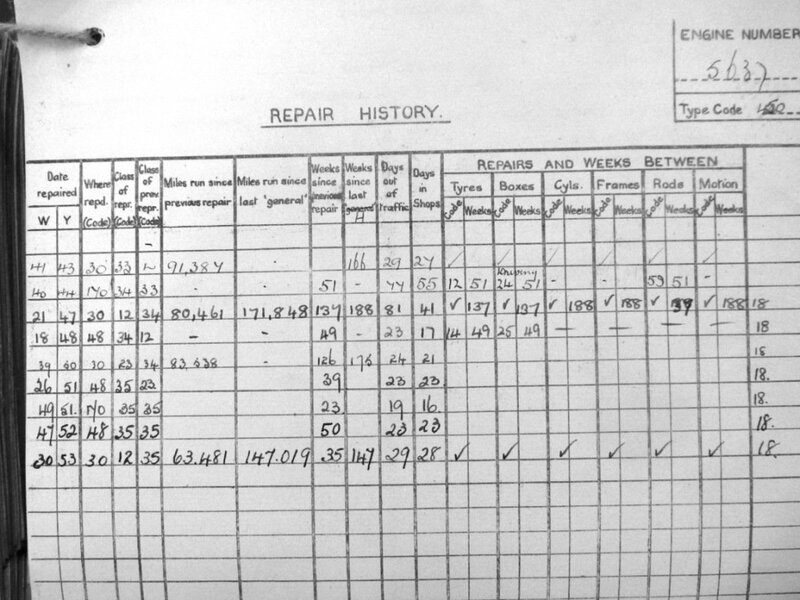 The National Archives records show 5637’s Repair History (1943 to 1953), and Shopping Control (1956 to 1962), and finally the Condemned stamp on the Engine Record Card (15 June 1964). 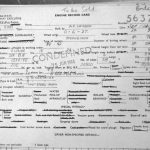 Interestingly, the Engine Record Card shows 5637 is fitted with 5633’s Boiler. With the end of steam on British Railways 5637 was withdrawn from service and sent to Woodhams Scrapyard. 5637’s withdrawal from service came in June 1964 when it was cleaned and placed in protective storage while it was based at the Barry Depot. This proved fortunate for 5637 as it was obviously much more convenient to send the loco to Woodhamís Scrapyard in Barry rather than another scrapyard where it would have been quickly cut up. This was also true for a number of other members of the 56xx class which were working in South Wales as, of the nine that have been preserved, eight were rescued from Dai Woodham’s yard. The other 56xx class locos that have been preserved are numbers 5619, 5643, 5668, 6619, 6634, 6686, 6695 & 6697. 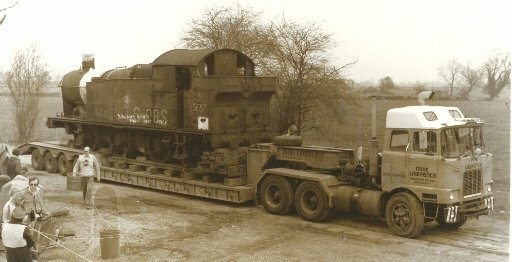 5637 was sold to Woodhams and moved to the scrap yard in September 1964. It was placed in the upper sidings at the end of the 4th line of 12 withdrawn locomotives waiting to be cut up. It remained there for almost 10 years gradually deteriorating in the wind and rain. Happily 5637 became the 61st loco to leave the Barry Scrapyard when it was bought by the Birmingham Railway Museum in August 1974 and taken by rail to their base at Tyseley travelling on its own wheels. This was not entirely successful as 5637’s front axle box burnt out during the journey and the loco had to stop at Gloucester shed for repairs. However, although originally purchased for preservation, no restoration work was carried out on 5637 and it continued to languish in a siding at Tyseley for another seven years. After 10 years in the scrapyard 5637 was purchased for preservation and taken to the Swindon & Cricklade Railway. Back in the late 1970ís the GW Steam Loco Fund was formed by members of the Swindon & Cricklade Railway (S&CR) to locate and acquire a Swindon-built Great Western Loco to operate on the S&CR. 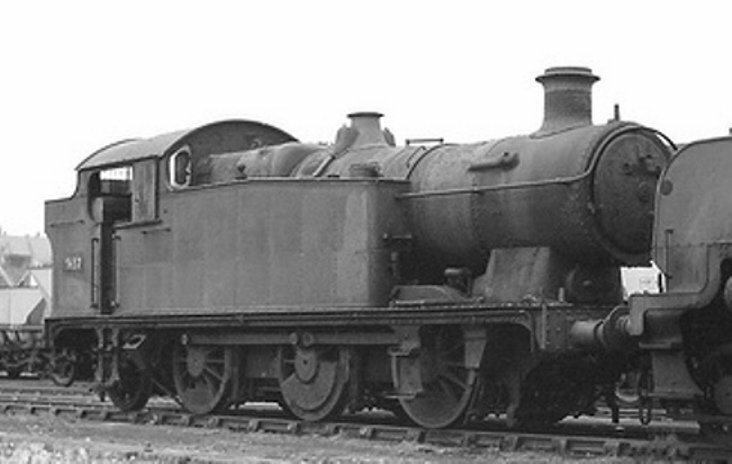 It was originally intended to obtain a small Prairie Tank but one couldnít be found and 5637 was available as it was no longer part of the Birmingham Railway Museumís plans. 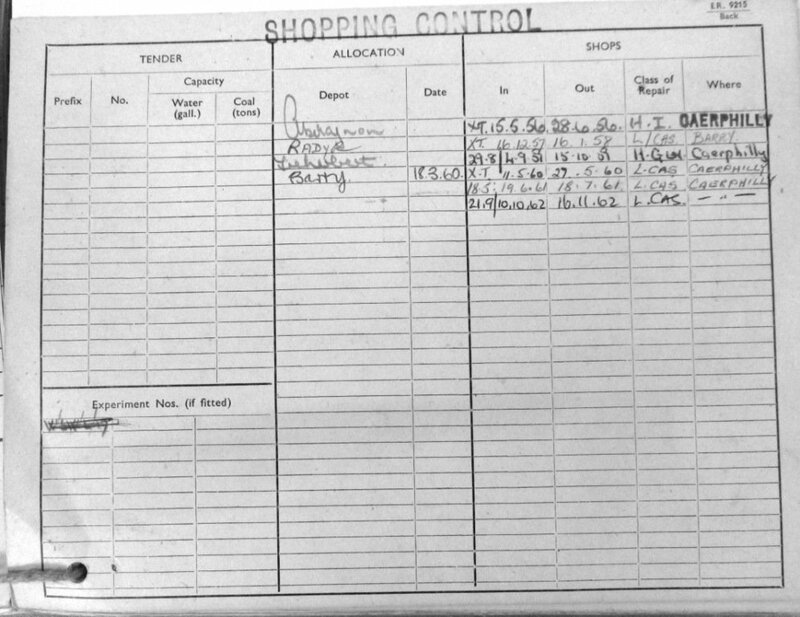 Thamesdown Borough Council, at that time the local authority for the Swindon area, had a number of sympathetic ex-railwaymen councillors who were prevailed upon to buy 5637 by members of the Steam Loco Fund. The local authority agreed to fund the £8,000 purchase price and the £1,500 cost of road transport plus VAT with the option of the group buying it when it had raised sufficient funds. 5637 arrived at the Swindon & Cricklade Railwayís Blundsdon site in early April 1982. The only preparation needed was to wrap the boiler in polythene sheeting to stop the asbestos insulation escaping through the large holes where the steel cladding had rusted away. The acceptance ceremony with the Mayor and Mayoress of Swindon in attendance took place on the 12th June 1982. The GW Steam Loco Fund was then reconstituted as the 5637 Steam Locomotive Group (SLG) which began selling shares and other fund raising to buy the locomotive from Thamesdown Borough Council for what was expected to be a nominal sum. However, this was not the case and 5637 was eventually bought on 26th May 1989 after interest payments on the initial outlay took the price to £13,688 plus VAT. The locomotive was gradually restored to running condition in primitive working conditions. Once the locomotive arrived at the S&CRís Blundsdon base it was quickly dismantled to its component parts by a team lead by the legendary Mad Gas-Axe Man, cutting up a lot of parts in the process that had to be replaced later. 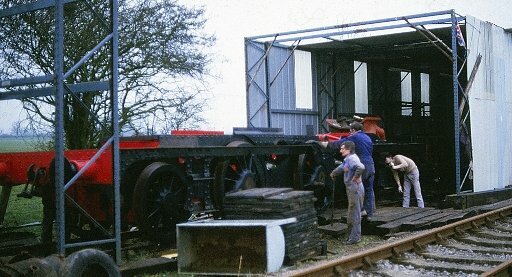 Some time was spent constructing a temporary engine shed but this was blown down in gales when another loco group removed the cross bracing and neglected to replace it. This meant that most of the restoration work was carried out without any workshop facilities or even protection from the elements. A van body was used for storing tools and equipment and a generator provided power for tools. A tarpaulin was placed over the engineís motion to keep of the worst off the weather. Ironically the S&CR were building extensive engine shed facilities at this time which only became available for use once the 5637ís restoration had been completed. When the loco arrived from Tyseley it was discovered that all the non-ferrous fittings were missing along with many other items, such as the motion, valve rods and piston rings. All these items had to be located, machined and fitted, along with many other parts including the ashpan, big ends, cladding and boiler tubing. Car manufacturer Rover helped out by bending sheet metal and creating the big end patterns. However, very little work was required on the running gear because of the quality of 5637ís last overhaul shortly before withdrawal. It was the last Class 56xx to undergo a major overhaul in Swindon Works. The chassis was then reunited with the wheels and the water tanks and coal bunker refitted. All the work necessary on the rolling chassis was undertaken, including refurbishing the motion, brake gear, steam and vacuum brake systems. Some of the restoration work was carried out by engineering trainees from the Swindon Skills Centre, who worked on restoring the coalbunker and side tanks. 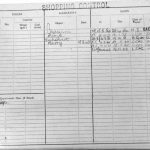 A new ashpan was supplied free of charge by a Midlands’ engineering company. The final phase of the restoration, involved the repair and retubing of the boiler. Fortunately, the boiler proved to be in relatively good shape and major works were not required at the time. The bottom row of 57 steel stays were replaced, some welding carried out on the boiler shell, mudhole doors, washout plugholes and various parts of the front tubeplate. Hydraulic testing began in earnest at Easter 1997. 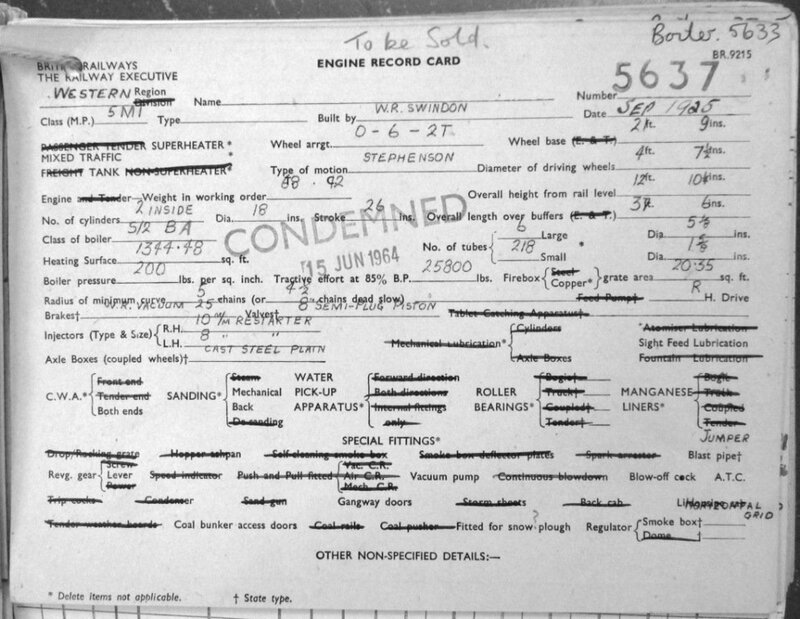 Minor water leaks were discovered, but following rectification and a final hydraulic test on 17 July 1997 the inspector passed the boiler for service. The final steam test came in late September 1997 and, having passed successfully, the boiler was replaced in the frames. 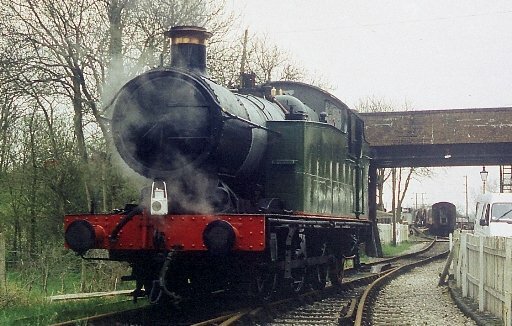 5637 was finally returned to steam 16 years after it arrived at the Swindon & Cricklade Railway. Initial steam and running-in tests took place on 28th March 1998 and sixteen years after the locomotive arrived at Blunsdon work was advanced enough for 5637 to enter service. Easter 1998 saw the locomotive hauling passengers on the S&CR for the first time, unannounced and probably unnoticed by many of the visitors. 5637 starred in the SCR’s gala weekend the following May hauling a passenger train albeit still painted in undercoat. It is estimated that the whole project cost around £80,000 to complete. It was hoped to eventually carry out the correct modifications to restore 5637 to its original condition but funds to do this were not available at the time. The SLG decided that it was better to have the engine working as soon as possible rather than wait several years for a perfect restoration. However, the Swindon & Cricklade Railway had not grown to the extent envisioned when it was originally planned to obtain a mainline engine to run services. The S&CR authorities thus decided that they couldnít afford to use 5637 regularly as it was more economical to use small industrial locos given the current length of the running line. This coincided with the failure of the East Somerset Railwayís (ESR) main line locomotive, a Jinty Tank, and the desperate need for a loco powerful enough to haul trains up the steep gradients on the line. The 5637 SLG thus decided to hire 5637 to the ESR so the loco could earn enough money to keep running for the foreseeable future. 5637 goes to work at its new home on the East Somerset Railway. 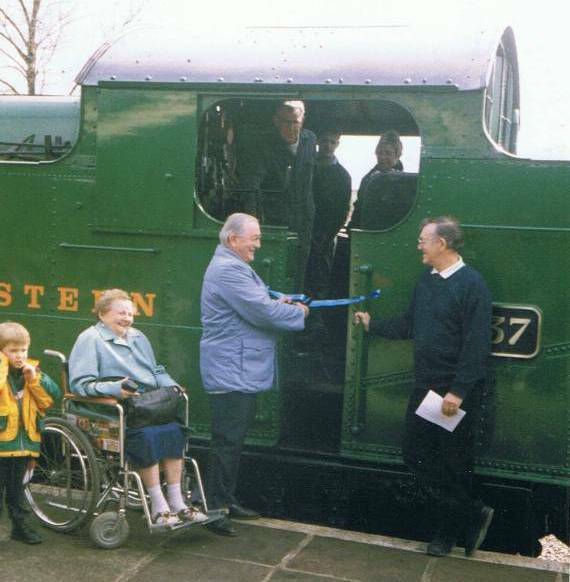 The locomotive was then transferred to the ESR in July 1998 where it finished its running in. 5637ís restoration was finally completed when it was painted in its 1925 Great Western livery at the ESR in February 1999. When 5637 was first restored it was fitted with a GWR type ejector, which was fine for two coaches on the S&CR. However, when the loco moved to the ESR the ejector was unable to cope with five coaches and the ESRís 21î ejector had to be fitted. There were various unsuccessful attempts to get a GWR type ejector working since but without success. Apart from it looking ìwrongî, the 21î ejector obscures the driverís view ahead. 5637 worked more or less continuously at the ESR for nine years with a couple of breaks for fairly major boiler repairs. In November 2002 a number of boiler tubes had failed and it was decided to fit a complete set of new tubes. Following this failure the Loco Department introduced a more comprehensive boiler water treatment programme to reduce boiler wear and tear, especially to tubes and stays. Following the retubing in 2002 the locomotive was repainted into BR Black with an early crest to meet the ESRís requirements. In 2003 it was discovered that the safety valve casting was defective with leaks and cracks and unfit for use. However the 6695 Group and then the 2807 Group came to our aid and lent 5637 their safety valves. 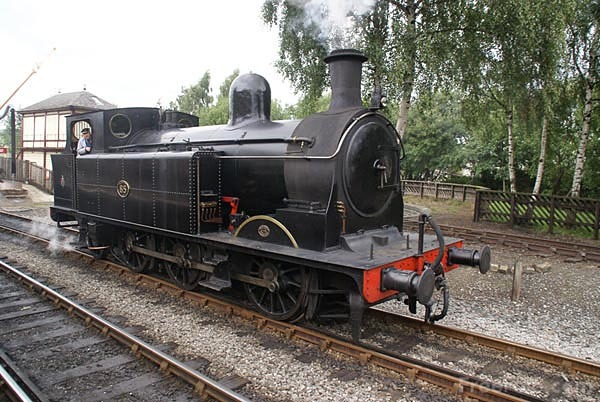 A new safety valve was eventually purchased from the Severn Valley Railway. Though it has been based at the ESR since 1989, 5637 has made short visits to a number of other railways including the Severn Valley Railway, Barrow Hill, the West Somerset Railway, the Llangollen Railway and the Mid Hants Railway. It was during the loco’s return from the Mid Hants line in September 2004 when being unloading from a lorry trailer the rear right hand driving wheel dropped about two inches. This does not sound much but unfortunately the axle load at that point is nineteen tons and the shock load shattered the main spring and was transferred into the firebox where around twenty steel stays then sheared off on the steel plate side. The loco’s boiler certificate expired in 2007 and over the next three years 5637 underwent a complete overhaul. It has now returned to service in its third livery since restoration, BR lined green. Since it’s overhaul 5673 has made two further short visits to other railways, a ‘home’ visit to the Swindon & Cricklade Railway and a visit to the Pontypool and Blaenavon Railway. 5637 has continued to run reliably at the East Somerset Railway and in early 2016 a complete re-tube was carried out.